You can customize the non-standard units like bottle, cups, pkts, pcs etc. to standard units like kg, g, ml, l etc.,. The price of some ingredients will remain blank if the SKU conversions are missing. 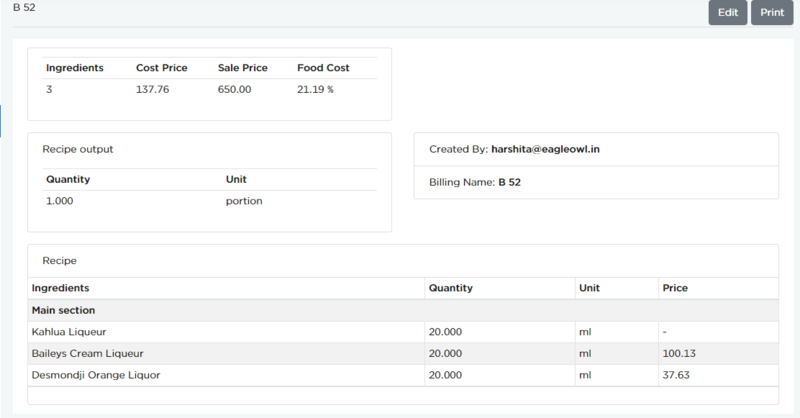 This kind of situations are seen when their is a mismatch of SKU units in purchase and recipes. In the above example, the price of "Kahlua Liqueur" is missing in "B 52" recipe. This is because the conversion of "Kahlua Liqueur" from bottle to ml is missing. In the above example, the price of "Eggs" is missing in "FIRED FISH FINGER" recipe. This is because the conversion of "Eggs" from nos to ml is missing. Go to SETTINGS -> Conversions to make conversions. 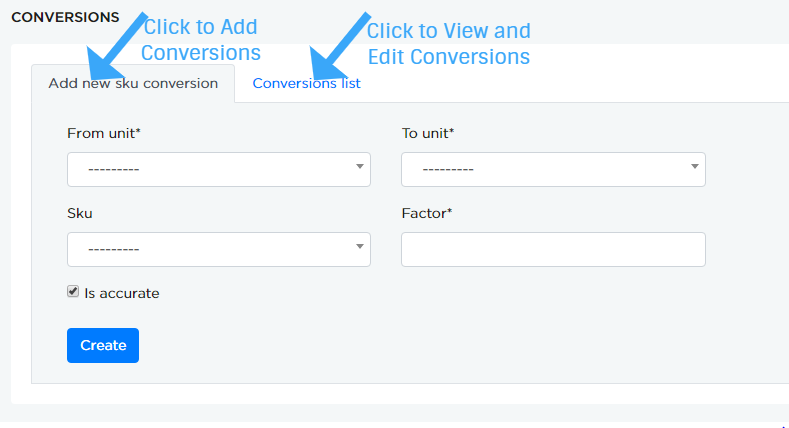 As shown above, it is the default view of the conversions page. Is accurate: This option is selected for the true/accurate conversions. By default, all the conversions are considered as accurate. Click Create to save the conversion. Now, 1 bottle of "Kahlua Liqueur" is considered as 750 ml. NOTE: If the entered conversions already present in the system, then it throws an message for the same. Now, 1 nos of "Eggs" is considered as 15 ml. As shown in above example, 1 pieces = 5 g.
NOTE: Since the system already provides some standard global metric conversions it is not necessary to create global units conversions. 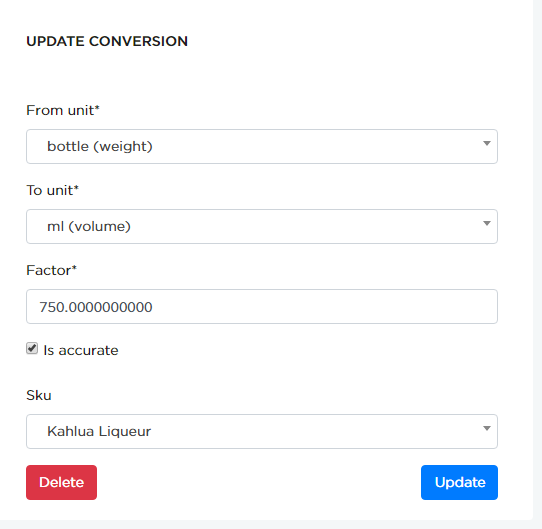 In this section, you can see all the entered conversion of SKUs, recipes and units. 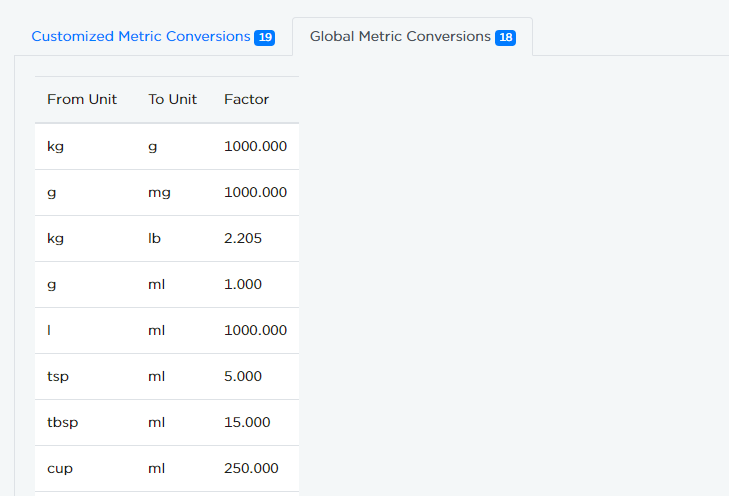 As shown in above screenshot, Customized and Global Metric Conversions are listed out separately by the system. 1. 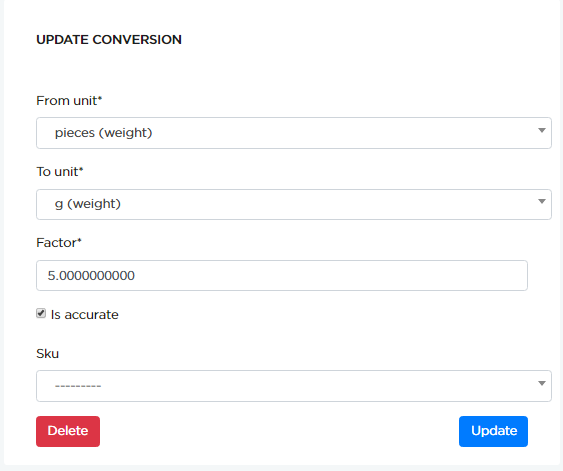 Customized Metric Conversions: These are the conversions which are created by the users and can be customized/edited later. 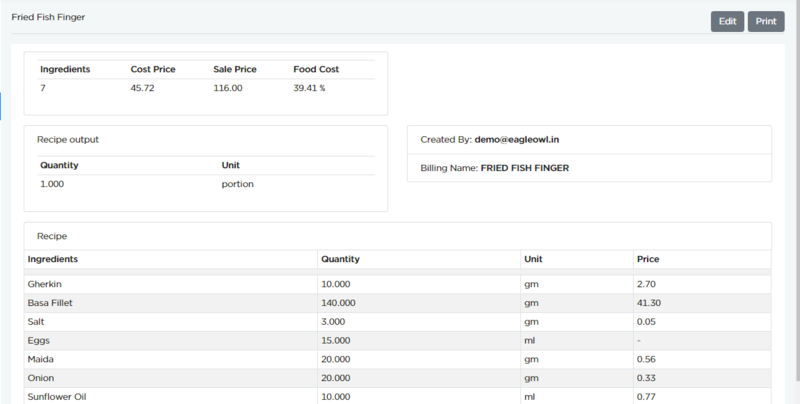 Customized metric conversion is further divided into three section i.e, SKU, Recipe and Without items. 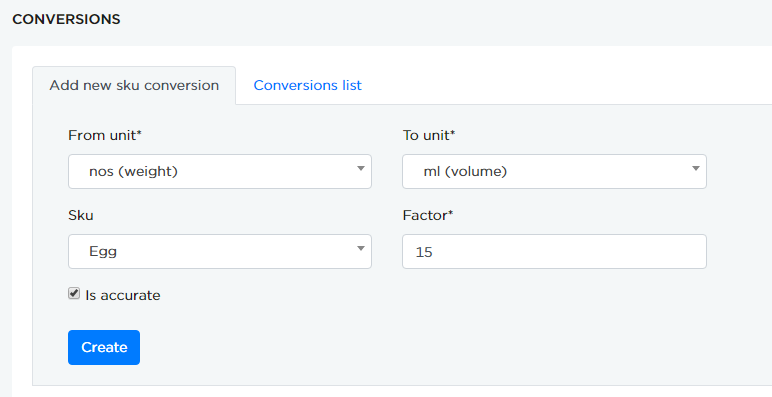 SKU: In this section, you can see all the SKU conversions added by the respective user. 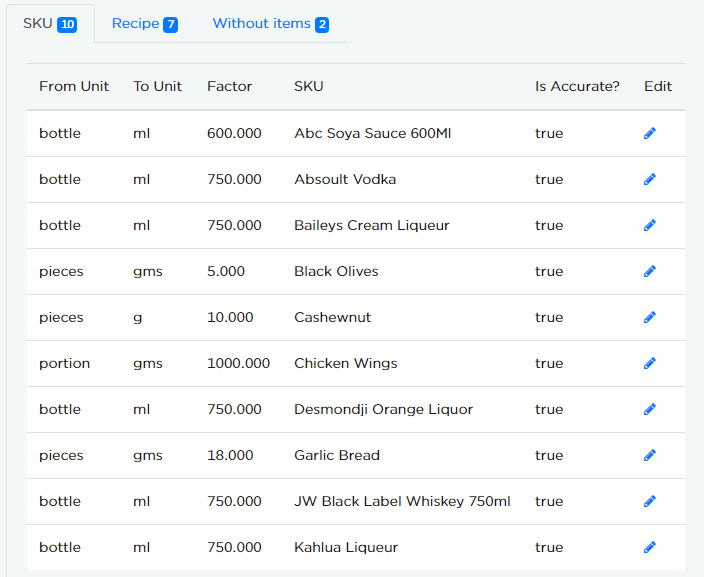 Recipe: In this section, you can see all the recipe yield added by the user during recipe creation/addition in RECIPE page. IMPORTANT NOTE: Click here for more details on Recipe conversions. 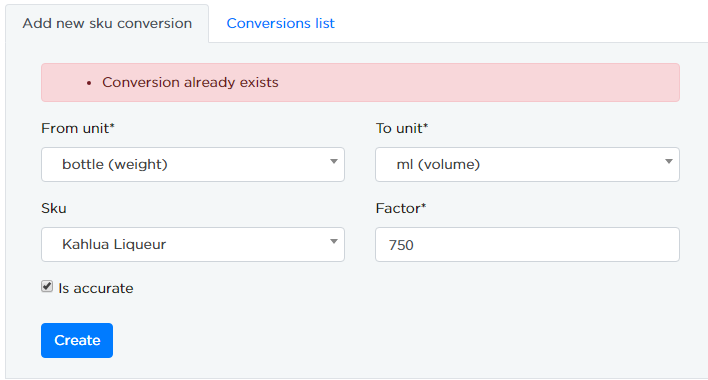 Without items: In this section you can see global unit conversions added by the user. 2. Global Metric Conversions: These are the conversions which are present in the system and it is applied globally. Click Delete to delete the conversion. Once you click on edit icon you will be redirected to RECIPE page where you can edit the recipe quantities. Since it is an non- sku, the SKU field is blank. You can search by SKU or Recipe to check the entry of conversions. 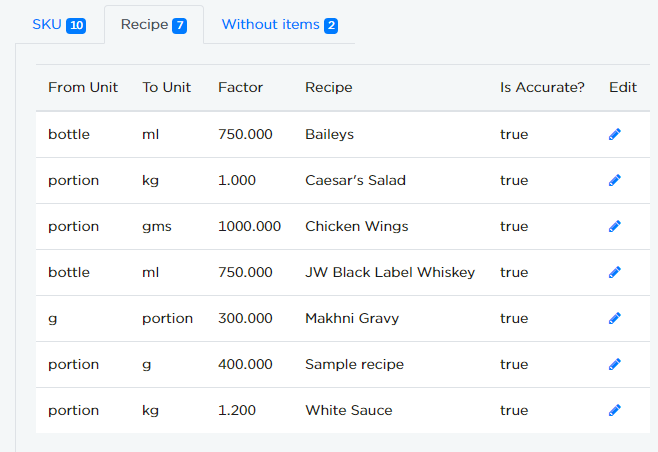 In a similar way you can search the yield of recipes in Recipes section.